Miguel’s Diving began dive survey work in 2000. 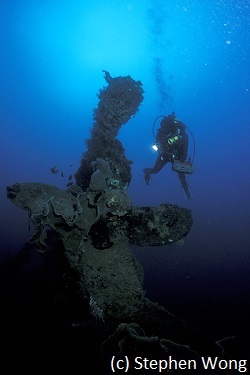 Wreck diving in Gorontalo began after the discovery of sunken ships. Not all are suitable for recreational divers. We offer two with fascinating histories. Our staff measured and diagrammed these two wrecks. 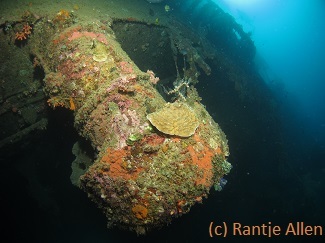 One of the wrecks used for wreck diving in Gorontalo sunk in 1942. That is the year of Gorontalo’s independence from foreign powers. A Japanese cargo vessel loaded with copra, wood and rattan caught fire after sailing. The helmsman turned the ship around. He tried to return to port. He wanted to run aground on a sandy beach but hit a coral wall instead. The impact immediately pushed the stern underwater. The entire ship quickly sank. All crew managed to swim ashore safely. But the ship and its cargo were a total loss. The ship now rests upside down just off the wall in 50 meters of water. Its propeller rises within 26 meters of the ocean surface. Two-thirds of the hull leans on a rocky outcrop, falling at a 14-degree angle. Then the hull buckles horizontally with the stern resting on the ocean floor. The wreck is almost level, tilting only slightly seaward. The hull bottom of the stern is heavily sprinkled with gorgonian whips. They look purple in ambient light but are actually maroon. About midway, a large tear in the ship’s port side provides access at 44 meters. Light is visible underneath the wreck from tears in its starboard side. The ship’s bow is almost completely exposed with two decks clearly evident. In December 2010, a storm tore part of the hull away. The deepest third of the wreck now lies below 50 meters. 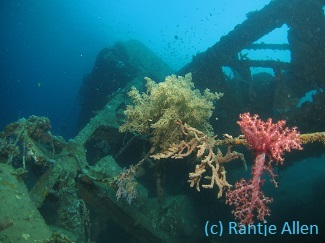 While wreck diving in Gorontalo, divers can hover over the deep portion to see of this wreck. Clearly, the metal of this old wreck is quite brittle. Miguel’s Diving does not allow penetration. The wreck originally was 50 meters long, 7 meters wide, and about 5 meters high (hull to deck). Conditions: Visibility on the wreck is typically about 15 meters. Even when upper waters are cloudy from runoff, visibility is often better below. Currents are seldom an issue. Special Note: This deep wreck is only offered to advanced divers. Miguel’s Diving does not offer decompression diving nor encourage wreck penetration. Remember: the nearest hyperbaric chamber is a long day’s overland journey to Manado. Descend past the first wall to a sandy crater. This area is filled with branching coral, scalloped algae and an encrusted anchor. Huge metal beams hang off the top of the second wall at 18 meters. They are covered with corals, sponges and other marine life. A large Yellow-mask angelfish (Pomacanthus xanthometopon) plays hide-and-seek among the beams. A Hawksbill turtle (Eretmochelys imbricata) sails into the deep. Following your dive guide, approach a thin line in the gloom below. Suddenly, the wreck appears. Swimming down the wreck’s length, head towards the stern. You can inspect several sea fans near a patch of purple gorgonians. Goatfish scour the hull for food. With a careful eye on your computer, descend down the face of the wreck. Peer inside a large tear in its hull. Your dive torch illuminates a host of sweetlips, snapper and other fish underneath. Follow you dive guide to the bow. A new species of coral shrimp can be seen while wreck diving in Gorontalo. Near the bend in the hull, look for a colony of bubble coral. It hosts a Coleman’s coral shrimp (Vir colemani). It was named in December 2003. Ascend to see a pair of Bumphead parrotfish (Bolbometopon muricatum) swimming loops around the propeller. Slowly ascending along the coral wall, notice the wildly carved surfaces of several large Salvador Dali sponges (Petrosia lignosa). As time and air allow, feel free to explore the coral slope and walls that reach all the way to the surface. On December 26, 1993, a dredging barge named Tjenderawashi was tethered for an excavation job. That night, rains and massive waves sunk the barge. Workers tried to use hundreds of empty oil barrels to try to re-float it, to no avail. It currently rests along a steep slope. It is firmly lodged on four rocky outcroppings. It is almost up side down and tilts at a 20-degree angle. Cables and numerous barrels hang in mid-water down its ocean-facing side. They are heavily encrusted with marine life. Other wreckage and many barrels litter the rocky slope below the suspended wreck. The barge peaks at 4 meters and bottoms out at 26 meters. The barge’s bottom faces upwards and is only sparsely encrusted. But everything that hangs below is a maze of sponges, encrusting corals and oysters. Soft coral grow up side down on hanging cables. As expected, the wreck has attracted much fish life in the years below. Many can be seen while wreck diving in Gorontalo. This includes lionfish, large sweetlips, various angelfishes and batfish. Miguel’s Diving staff has identified 140 species of fish alone here! The barge hosts an unusually large number of Raccoon butterflyfish (Chaetodon lunula), countless Diana’s wrasse juveniles (Bodianus diana), a pair of large Mappa puffer (Arothron mappa) and mature Painted lobsters (Panulirus versicolor). Several giant clams live in the crane tower! The uncommon Twinspot chromis (Chromis elerae) thrives in its underbelly, as do many cardinalfish species. 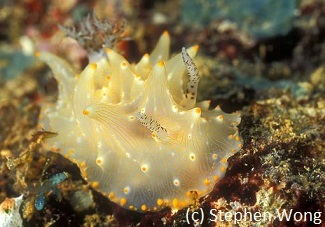 A Coleman’s coral shrimp, newly described in 2003, was photographed and collected from this site and sent to the researcher. This purple-jointed beauty is common in Gorontalo waters. The barge is 32 meters long and 10 meters wide. The crane tower extends another 16 meters beyond the barge. Conditions: Visibility can vary considerably. Water from the nearby river and heavy surf can render diving this wreck inadvisable. Cold up-wellings can cut visibility during the course of a dive. Bubbles also disturb fine silt on the wreck. Special Note: Although no penetration is involved, the most interesting part of this dive involves diving with the wreck overhead. Divers must be careful in ascending even slightly while underneath it. Lionfish cruise the underside of the wreck. You do not want to bump one with your head! Also, swim carefully around the hanging barrels and cable. These all move. Swimming completely underneath the wreck to the other side is possible. However, there is not much to see in the shallow rubble. A safer alternative is to explore the barge, then the dredging crane, and then proceed to the rocky slope on the other side. Descend towards the shallowest point of the wreck. Follow the dive guide along the hull’s bottom edge to the gloom below. Descending further, peer inside the cavity of the engine area where sweetlips swim. A large Dendronephthya soft coral grows in midwater up side down on the bottom of a cable that hangs off the wreck. Heading toward a pair of pylons, explore the underside of the barge. Inside the rusted cavity of one pylon, a pair of pipefish hides from the dive light. While inspecting a cluster of barrels, a diver touches one and the entire cluster sways. These barrels are entirely encrusted. Oysters growing on them quickly snap shut as you approach. Another diver hangs up side down, trying to read the letters that spell out the barge’s name. While wreck diving in Gorontalo, take time to search for shrimps. The new species of coral shrimp is found here. it is Vir colemani. An Anton Bruuni shrimp with its characteristic red and white spots jumps into the shadows. Down by the observation pole, the slope is littered by clamshells. Among them, strange shrimp with long claw arms jump around. Nearby small schools of the endemic Orangeback wrasse (Cirrhilabrus aurantidorsalis 1999) circle in midwater. Flasher wrasses prowl close to the rubble. A pair of large Mappa puffers watch the invading humans below. Now at shallower depths, explore the crane tower. It is full of fish and light. Wave to your dive buddy through the open grid work on the other side. Circle back to the descent point. Watch fish playing below you during the safety stop.